Once in a while, donuts and I will have a thing. Once in a very great while. I don’t actually do donuts, most of the time. Unless I make them. I never eat purchased donuts. It’s something I stopped doing in high school. For whatever reason. Who knows what was going through my teenage mind back then. I also don’t live near any cities where good donuts are actually a thing. Around here it’s just the gross chain breakfast places like Dunkin’ Donuts. Yuck. With that being said, I will gladly eat a donut I make. Especially if they are baked. Or if I come across a killer donut shop, maybe I’ll sing a different tune. Once in a while, I will get the urge to make some donuts for the family. They have to be planned accordingly because they don’t last more than a day or two after they are made. Really, they are best the day they are made. So, I have to make donuts when we are in between desserts in the house. A few weeks ago, pre-snow storms, and when I thought Spring was actually here, I got the donut urge. I really wanted to make baked donuts, because I didn’t want to go through the whole frying process. (And you feel better after eating a baked one, even if it’s all mental) I also wanted to fill them with some citrusy curd. I thought that would only be fitting for this time of the year. These donuts are light, fluffy and perfect. They are super easy to fill. 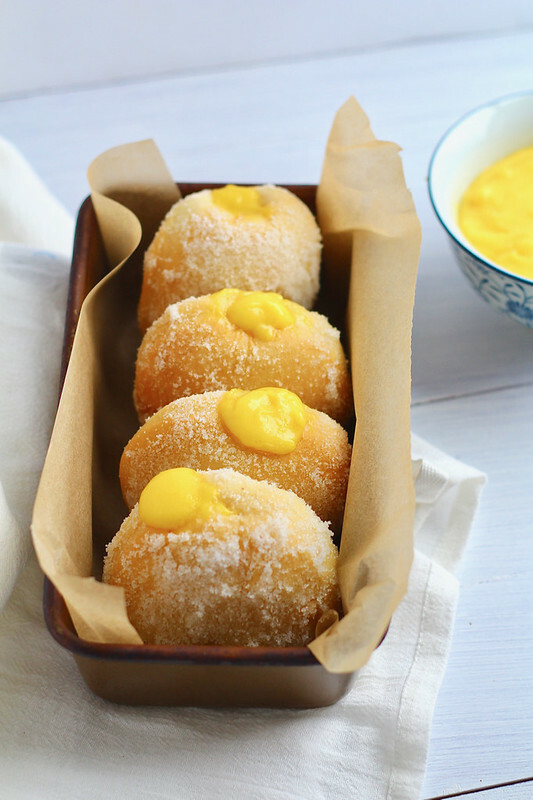 The tart lemon curd pairs beautifully with the sugar crusted donut exterior. It was a match made in heaven. If you plan on making these, but not serving immediately, only fill the donuts that will be consumed right away. Fill and serve any remaining donuts the next day, or whenever you plan on eating. These would make an excellent Easter breakfast treat, or look beautiful on your brunch table. To make the lemon curd, place the sugar in a medium, heat proof bowl. Zest the lemons into the sugar and rub your fingers in the sugar/zest, to release the oils. Meanwhile, fill a small pot half full of water and bring to a simmer over medium heat. Place the bowl with the lemon sugar over the barely simmering water, ensuring the bowl is not resting in the water. Whisk in the lemon juice, egg yolks and eggs. Cook, whisking constantly until the curd is thick and the whisk leaves tracks, 8-10 minutes. Immediately remove from the heat and whisk in the cubed butter. Strain the curd through a fine-mesh sieve into a clean bowl. Cover the bowl and refrigerate until completely cool, about 2-3 hours. The curd will last in the refrigerator up to a week. To make the donuts; in the bowl of a stand mixer fitted with the paddle attachment, whisk together the yeast and milk. Let sit for about 5 minutes or until bubbly. In a small bowl, whisk together the bread flour, all-purpose flour, sugar, salt and nutmeg. With the mixer on low speed, slowly pour the flour mixture into the yeast mixture. Stir in the egg and vanilla extract until just combined, then mix in the butter. Increase the speed to medium and mix for 5-8 minutes, until the dough pulls completely away from the bowl and dough is smooth. Turn the dough out on to a lightly floured surface and form into a ball. Place in a grease bowl, turning once to coat, cover with plastic wrap or a clean kitchen towel and place in a warm spot. Let rise until nearly tripled in size, 2-3 hours. Once the dough has risen, preheat the oven to 350ºF. Line two baking sheets with silpat or parchment paper. Gently deflate the dough and roll out on a lightly floured surface to 1/2-inch thick. Using a round 3-inch biscuit cutter, cut the dough into rounds and place on the prepared baking sheets. Re-roll the dough only once. You can discard the scraps or bake them for bite-sized snacks. Place the donuts in the preheated oven and bake for 10-15 minutes, or until light golden brown. Cut a small hole in the side of each donut to fill with curd later. If serving immediately melt the butter in a small bowl or saucepan and place the sugar in a shallow bowl. Brush or dip the baked donuts in the melted butter then immediately roll in the sugar, shaking off excess. Spoon the lemon curd into a pastry bag fitted with a plain round tip. 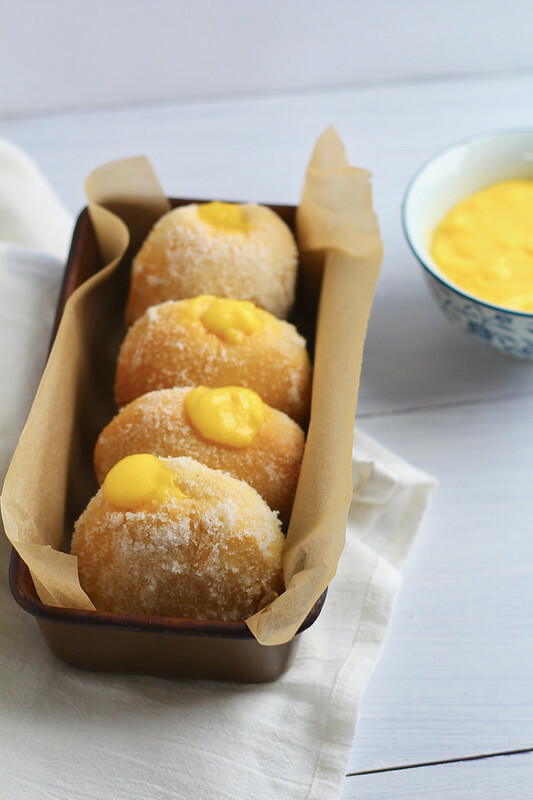 Pipe the lemon curd into the pre-made hole of each donut, until slightly puffy. Serve immediately. If you plan on serving later in the day or the next day, follow the directions up to filling with lemon curd. 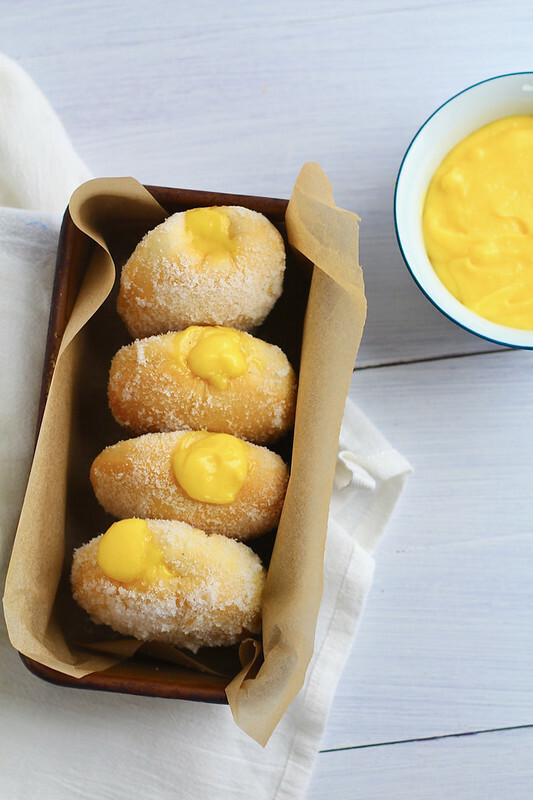 Store the donuts at room temperature loosely wrapped, and fill with the lemon curd only directly before consuming.